Blue and white, but completely green! Wind turbines, the vast grey propellers that are popping up all over the country, are hailed for their ecological benefits. But how many people actually know how they work? I was lucky enough to attend a recent press briefing on the subject, and was amazed by the difference between the public perception of wind turbines and the actual facts. For instance, most people seem to believe that the turbines are a new development, but it seems the wind has been driving similar devices for many decades. Wind-mills are used to grind up grain into flour all over the world, and they work on a very similar principle. But the biggest gap between fact and perception is the ecological benefit of wind turbines. Many people think that turbines may be less 'green' than they were originally led to believe. They think the benefits to the environment may have been exaggerated. Not so. I can categorically state that they are completely environmentally friendly. It all comes down to how they work. When it is windy, the wind causes the blades or sails of the turbine to turn. This rotary motion is converted into electricity by a generator and transferred to storage batteries in the base of the turbine. Then, when there is not enough wind to power the turbine the whole process is reversed. The stored electricity is used, changing the generator into a powerful motor which keeps the blades turning. 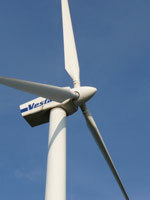 In this way the turbine is kept rotating whether there is wind or not. This of course means they are completely power-independent and require no electricity from the National Grid at all. So you see wind turbines really are green, and we should welcome them to the landscape in the same way we welcomed power station chimneys and electricity pylons in years gone by.